pilgrimage. | the reason that i laugh and breathe is oh love. the reason that i laugh and breathe is oh love. watch me grow: the finish line. 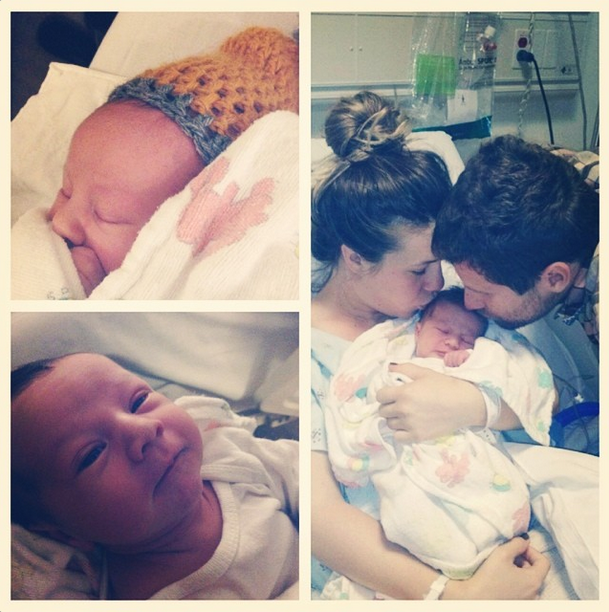 I am so happy to say that our sweet baby boy was born on June 25 at 8:17am. He weighed in at 7 pounds, 11 ounces and was 21.5 inches long. We love him so much and are so happy and doing well. 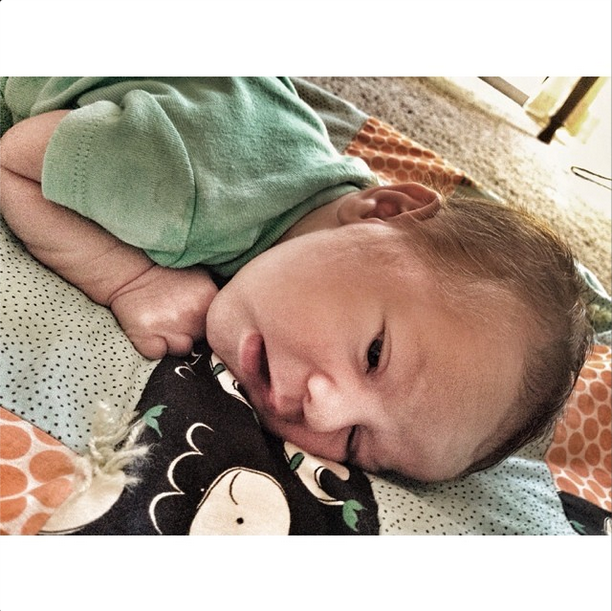 He’s already back up to his birth weight, lil champ! My family actually flew in the day he was born and has been here being an amazing help and support for Colby and I. We are all so thankful! It was really fun taking these weekly pictures and now looking back I’m so glad I have them. Here’s the last set! 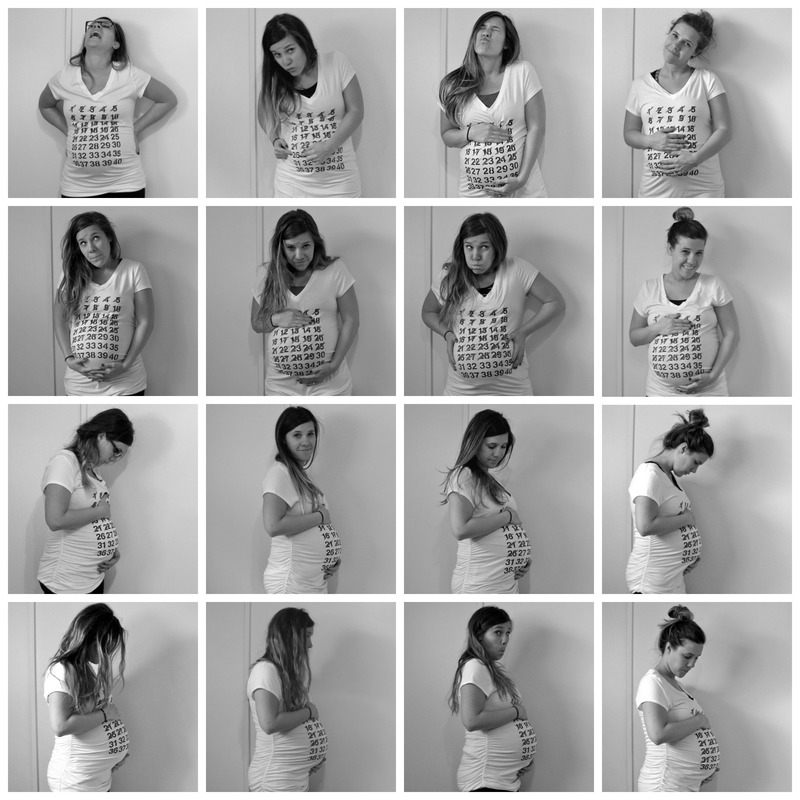 I didn’t make it to 40 weeks…hoooooray! 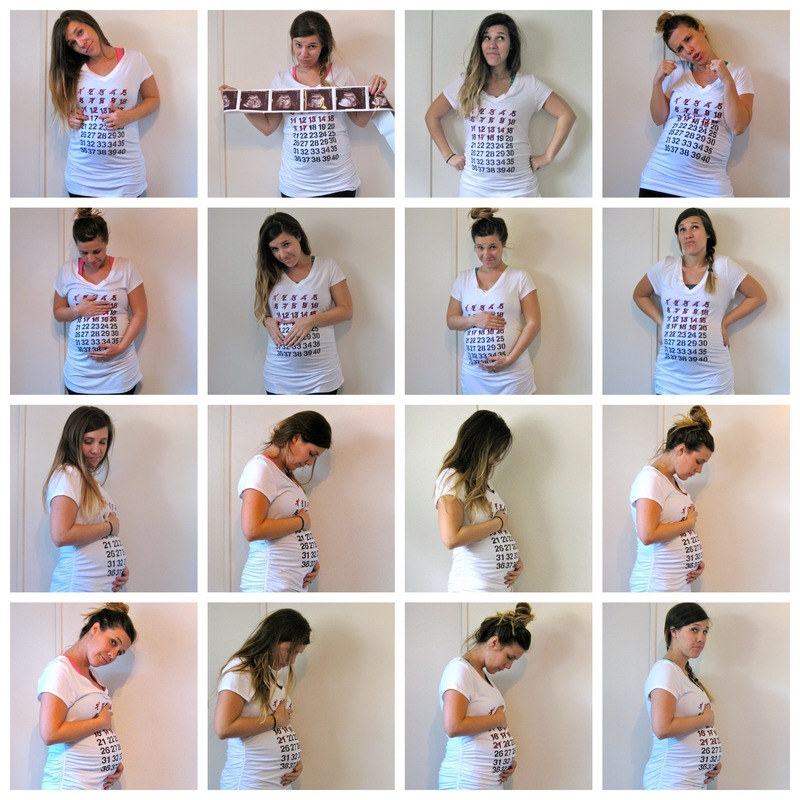 I went into early labor on June 23rd and Colby and I snapped a few last pregnancy pics. I look a little rough, but, hey, I was about to have a baby! This is what I look like now, a week out from delivery. I can’t even TELL you how amazing it feels to not be pregnant anymore. Even though I’m still recovering, I feel like I have my body back! I can move around and feel light and free! Plus I get the added perk of an adorable sweet little baby to hang out with 24/7. And because I know all you really care about is Calvin pictures, I’ll indulge you. We are tired, happy, in love, overwhelmed and every emotion in between. Thanks for loving us and thanks for caring. We have felt so supported through this crazy time! Yes, you read it right. 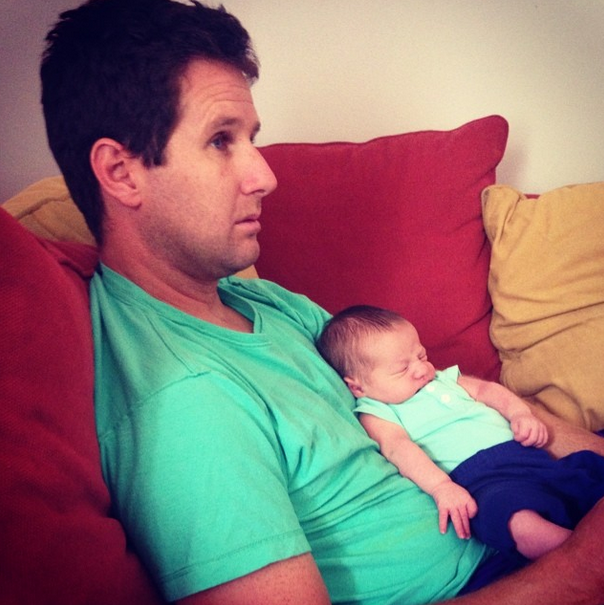 Our baby has a name: Calvin Ryan. We decided to stick with the family tradition of initials CRL just for this one, so baby Cal will have the same initials as his dad, grandfather, and great-grandfather. 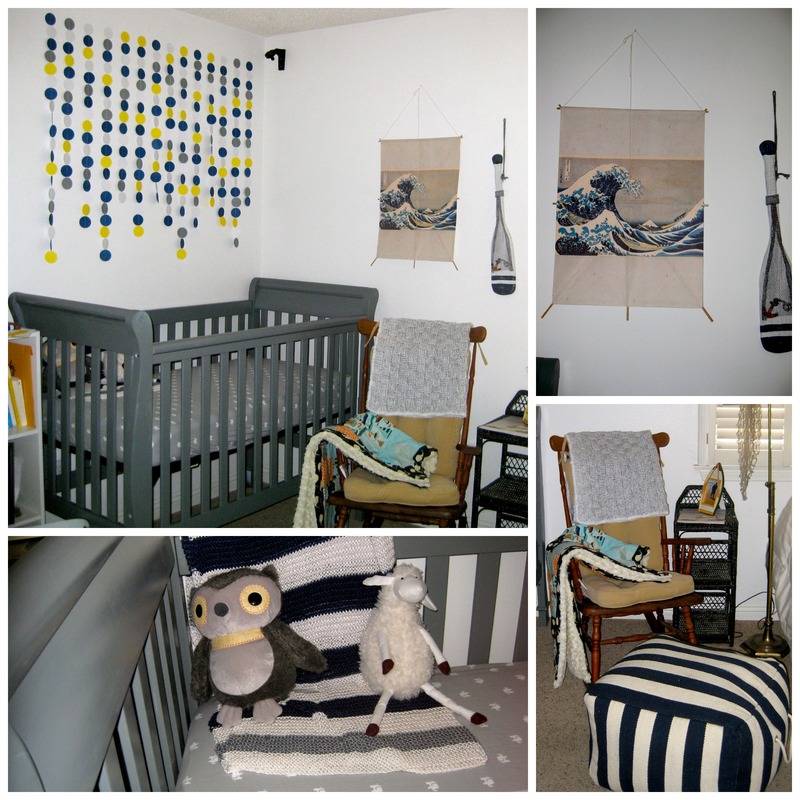 For his room, we landed on a hybrid theme of Where the Wild Things Are slash nautical. It works (haha, at least I think so) because Max sails over to the land where the wild things are. 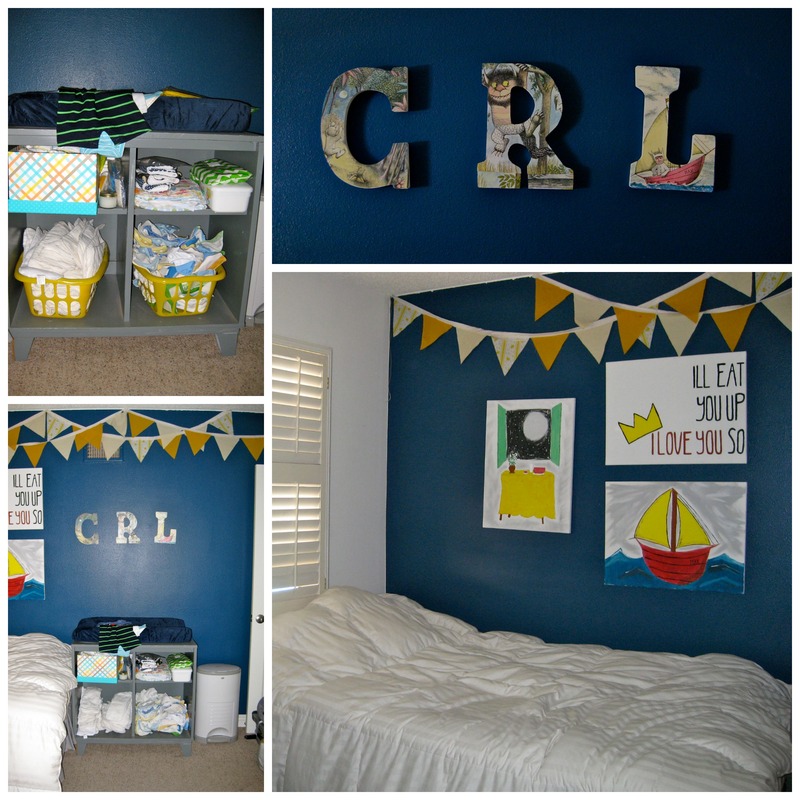 In the first picture, you can see some precious handmade things–a friend made the initial letters that hang above the changing table. My younger sisters painted the scenes and quote from the book. And that bunting? It’s still going strong–my older sister made it for our wedding. The bookshelf (right now) holds parenting books and kid books. I figure Calvin won’t be reading for a little while, so he can share with me. The shelf holds a few other special items, including a hand-sewn stuffed animal made by my older sister and a limited edition (haha) Brimpapery print that was a gift from my friend Jolie. My parents bought Calvin a set of Uncle Arthur bedtime stories, which are really beloved if you know them, and if not, you’re kind of like “who’s Uncle Arthur? ?” The anchor wall art was made by dear friends and gifted to us as well. A favorite little item in the room for me is the vintage Fisher Price record player. We loved ours as kids, and surprisingly, it’s pretty easy to snag one from eBay. I really love this corner with the crib. The bunting was made by Colby’s cousin Idalia, and I love how it turned out. The crib was a hand-me-down (so wonderful! ), and the kite with the wave painting came allllll the way from Japan and was sent by my aunt. We debated back and forth between glider and rocking chair, but ultimately, when I saw that pouf at Target, I had to have it, and rocking chair it was. Colby found the little side table at a yard sale for a dollar (I swear, that man needs to create a business out of his ability to find exactly the item that he’s searching for through bargain venues). The funny thing about decorating a baby’s room is 1) it’s actually not for the baby at all, because the baby does not and will not care for a long time and 2) you spend all this time getting it all ready and then you realize the baby will not even use the room for a couple of months. Now that it’s done, however, we feel more excited and ready for his arrival.Come on out, Calvin, we love you so much! Here are pictures from weeks 33-36. I’m now 37 weeks, meaning this baby could come out any time! (Did you hear that, baby?) We are ready to meet him and are excited daily by the prospect of what he will look like and who he will be. It’s hard to be patient, but at the same time, we are treasuring our last few days of life without a child. It basically feels impossible to process the change that is about to occur. We finished his room, and now it’s my favorite place to hang out. As I look around the room and think of all the people who gave us such amazing and generous gifts, I am so so thankful. We really have been provided with everything that we need for this little one, and I am so blown away by the incredible friends and family that we have to support us in this new stage. I plan to post pictures soon, so stay posted. We have new housemates and are so excited to be moving into this new season together with some of our best friends and their little girl. What a joy it is to live in community with such kindred spirits. I know that living together will be full of some of the most precious blessings and growing opportunities. I’m so thankful, too, for the summer and the opportunity to process our larger community that is our lifegroup and how God continues to lead us in that. I’m thankful that God has given me the space to reflect and seek him in this season of transition. Wow! 32 weeks. In reality, I’m 34 weeks now, but, hey, better late than never right. I can’t believe we are about 6 weeks away from meeting this guy! We finished all of our baby classes at the hospital and now are completely prepared to parent, labor, and breastfeed. Ha. Seriously, though, we are getting excited for him to come out into the world. 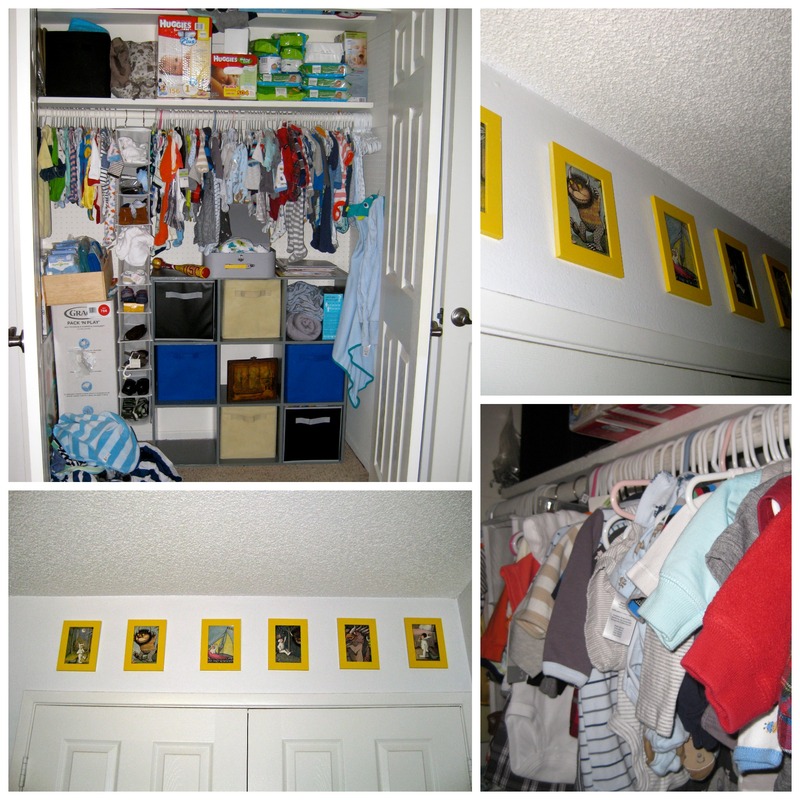 His room is coming together (little baby clothes on little baby hangers is the most ridiculous thing in the world…so cute). Not much else to say over here, besides the fact that I’d like this 100+ degree weather streak to end right now, kthanks. 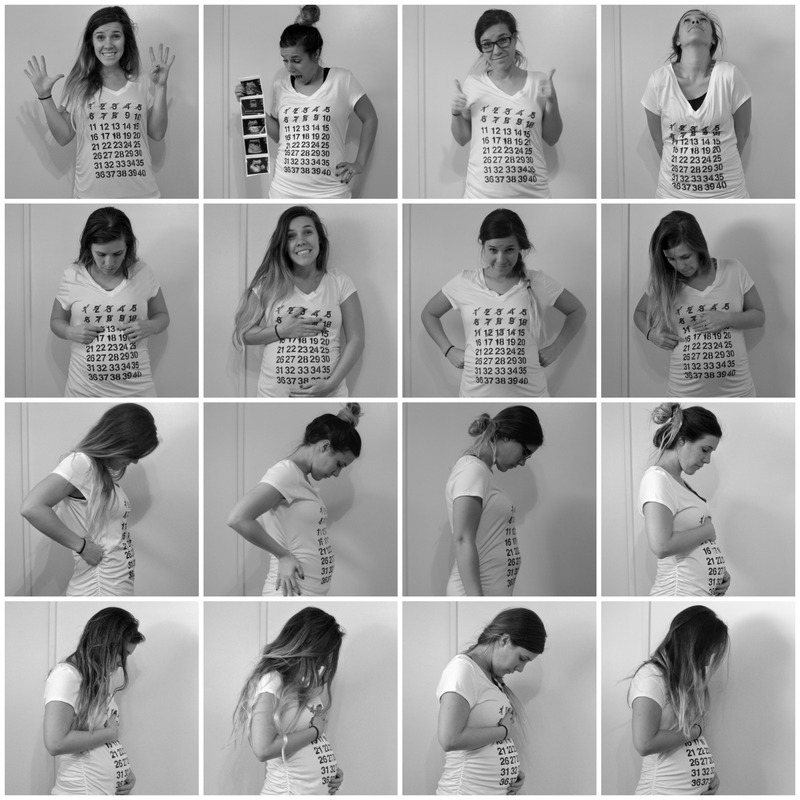 I was looking at the pictures I took earlier in the pregnancy…8 weeks? Hahaha. I don’t remember what it felt like to be that small. I imagine it to be very freeing once he comes out and I can start to get my body back. Rolling over in bed without a lot of effort sounds amazing right now. But overall, life is sweet, can’t complain. New roommates moving in soon and very soon, and popsicles are my best friend. 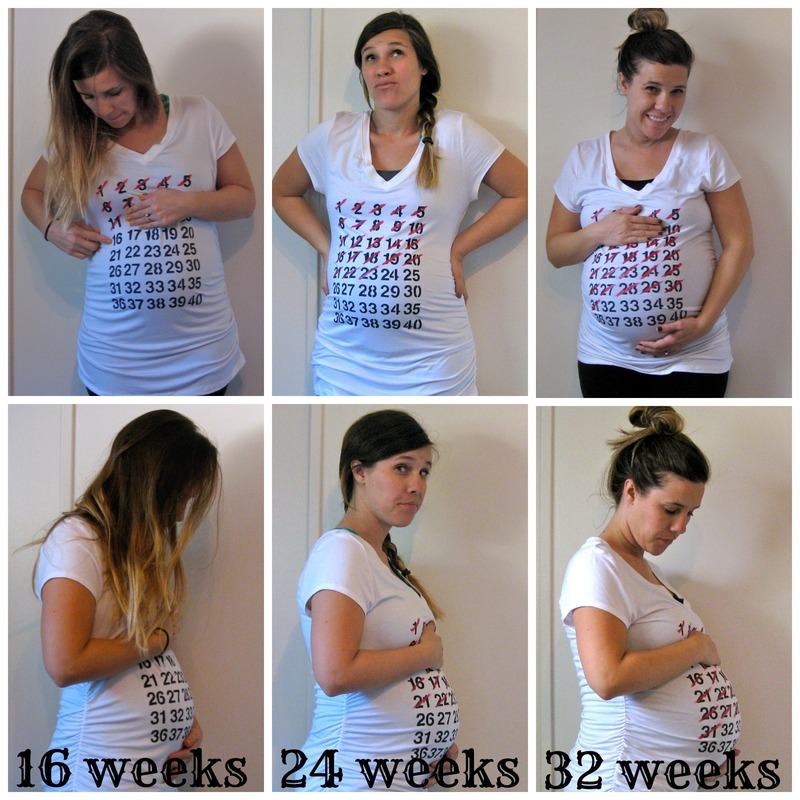 Who knows, maybe this is my last 8 week updates…only time will tell if we make it to 40 weeks….or past…. Is it safe to say I’m the worst blogger ever? I’m not sure what’s going on, but I guess I’ve lost my fire for writing. 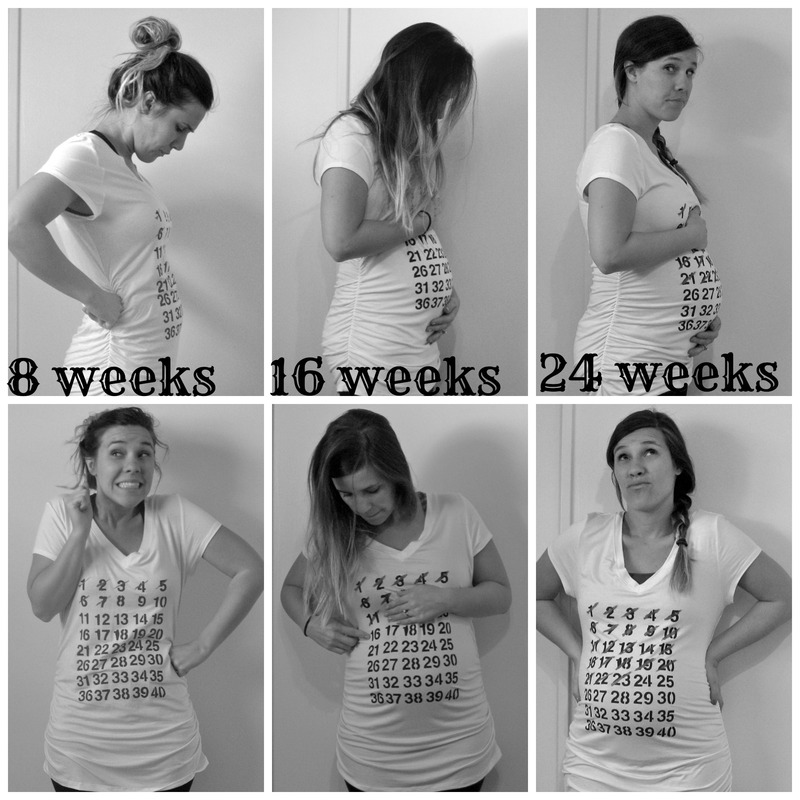 The last 8 weeks flew by, and here we are with some pregnancy pictures from weeks 17-24. The second picture is fun…we’re making progress here! I’ll be 26 weeks tomorrow with 14 (supposedly) left to go! Hurray! I’m getting to the point where it’s pretty much unavoidable that people will comment on my belly. Three questions I answer on a daily basis: 1) When are you due? 2) Boy or girl? 3) Do you have a name yet? Answers: 1) June 27. 2) Boy. 3) NO! All in good time. Once, a few weeks after we had already found out that it was a boy, I was in the elevator at work. An older man was waiting for the elevator with me and started asking me questions and then writing things down on the back of a receipt he pulled out of his pocket. After about a minute of mathematical calculations (??? 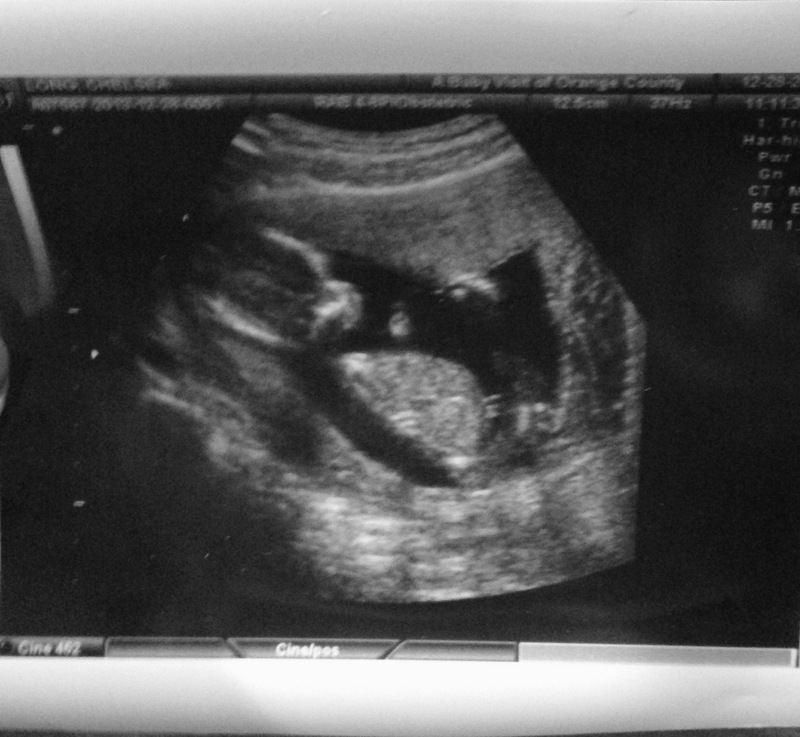 ), he proudly exclaimed, “It will be a girl!” I couldn’t find it in my heart to tell him we already knew it was a boy. I have good weeks and hard weeks, with the hard weeks consisting of tiredness, achyness, and grumpyness. I totally am that lady who sighs and grunts when she has to reach across the couch for her phone. I feel so big already and am getting bigger by the day. Sometimes it’s hard not to justify my bad behavior with pregnancy hormones. It’s kind of discouraging because it’s like PMS could hit at any time for 9 whole months (JOY!). Also I read this thing online about “testosterone rage” that women sometimes get when they’re carrying a boy. Awesome. Honeslty, though, I’m very happy and healthy and thankful. Being pregnant is a dream come true. I know the last 14 weeks will fly by! I’ve been taking weekly pictures, but in the interest of not wanting to annoy people with another baby bump blog post, I’ve compiled all of them from weeks 9-16 here. This is mainly for my mom and Colby’s mom and other mom-type people in my life who I know will love these pictures. Things are going great with us over here; I have an appointment tomorrow with my midwife. Excited to see the little nugget again. Colby and I made the shirt together. I got the idea from Miranda of One Little Minute. 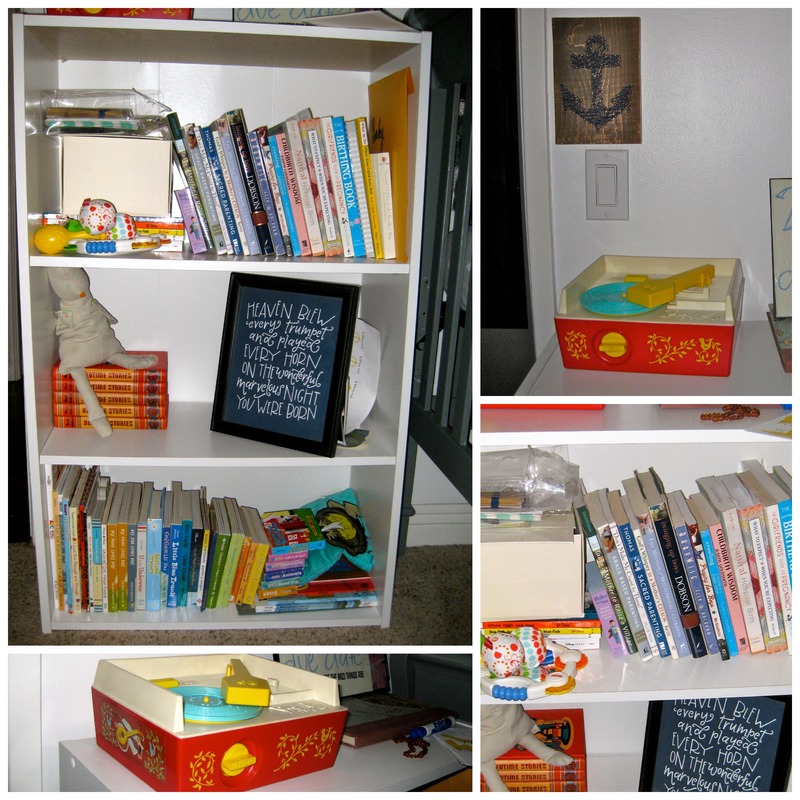 Her DIY can be found here! Besides being pregnant, other things are going well. I’m starting back to my second teaching job this week and excited to be back there. I’m teaching novice level (basically beginning level) which should be interesting. I’ve already had some fun interactions with students, which is what makes my job so entertaining for me. My students at the community college wrote out their goals and some small steps they can take to improve their English on their own time. I was practically exploding with pride and joy thinking about being a part of their growth and personal success. February is Mexico with sister and bro in law over Valentine’s and March is my birthday (we’re thinking Downton Abbey themed party…) and flying to TX for a World Race wedding. April is Ohio baby shower and May is California baby shower. So much to look forward to. God’s giving me a lot to think about, and some posts are brewing in my head, but all in good time. praise came before the miracle. I wrote this blog post on October 10th, 2013, about a week before I found out that I was pregnant after six months of trying. I hesitated to post it but ultimately decided that it’s a powerful testimony and wanted to share. I know that everyone’s story is different, and we can’t compare the ways that God works in each of our lives. I can’t explain why some people are unable to have children, and I believe God’s goodness is just as true to them as it is to me, but, that being said, I truly believe that through my faith and God’s power, he created a new life. Colby and I are so pleased to announce our sweet baby boy is coming June 2014. God’s teaching me something these days. It started a few weeks ago when a group of dear friends read aloud from Isaiah 61. The beautiful imagery fell flat with me as I heard about beauty and joy, gladness and praise. Those words indeed were beautiful, but they weren’t my reality. My reality was being in a place of mourning, ashes, and heaviness because I wasn’t pregnant. After 5 months of trying, I was empty. 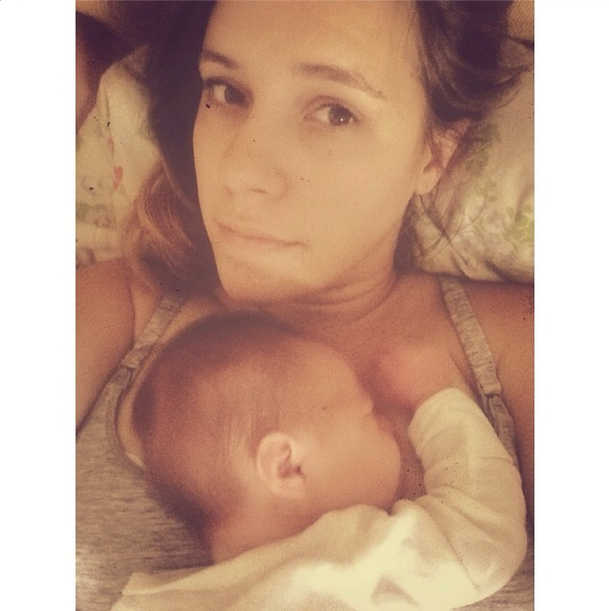 Literally—my womb was empty, but figuratively as well; I felt so empty. I felt completely devoid of any control in my situation as I waited with mounting frustration every month. In a powerful time of meditation and prayer, God gently reminded me to fix my eyes on not on what is seen, but instead on what is unseen (2 Cor. 4:16). God, with his sweet sense of humor, led me to 1 Peter 1:3 that says, “Praise be to the God and Father of our Lord Jesus Christ! In his great mercy he has given us new birth into a living hope…” And later in the chapter it repeats a familiar phrase on the same theme, “…Though you have not seen him, you love him; and even though you do not see him now, you believe in him and are filled with an inexpressible and glorious joy.” (v. 8). Those words brought me peace and hope, but God wasn’t done yet. Abraham was called out and named “father” by God years before it came to pass. Abraham believed it, and God did it. In God’s word, there are countless verses that promise children to his people. I started to write those down, take them to heart, and speak them out. I searched his word for promises and claimed them as my truth. I spoke into the future believing that God was going to make good on his word. In Acts 16:25-26, we see Paul and Silas in jail. They’re in there praying and praising God when, all of a sudden, a miracle happens. God caused an earthquake to break them free from their chains. The praise came before the miracle. May it be so in my life. I’m choosing to believe that the next time I take a pregnancy test it will be positive because God has promised goodness to me.